Soak the gelatine leaves in cold water for a few minutes. Meanwhile, gently heat the double cream with the sugar, vanilla pod and seeds until it just comes to a boil and the sugar melts, then remove from the heat. Squeeze any excess water from the gelatine leaves, then add them to the pan, stirring until melted. Strain the mixture into a bowl and stir in the milk and buttermilk. Grease the jelly mould lightly. Put the bowl of cream mixture in a deep roasting tin filled with ice cubes and water, so the water comes halfway up the bowl. Using a rubber spatula, stir the mixture as it cools and thickens. When the mixture is thick enough to stay apart for a second after you’ve dragged your spatula through, pour ?it into the jelly mould, then chill for 4-5 hours or overnight to set. To turn out the pannacotta, dip the mould briefly in very hot water, then invert onto a plate. Remove the mould, then chill the pannacotta for 15 minutes. 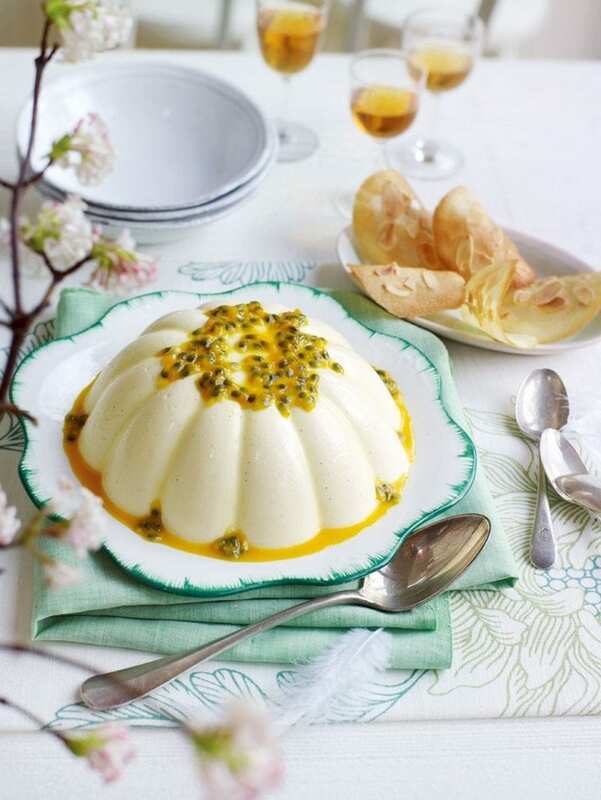 Serve with the passion fruit pulp drizzled over. Gelatine leaves vary in size from brand to brand and can affect how the pannacotta sets. We used Costa gelatine (widely available).